Kyrieru: Beginner: Low Res Character. Here's a step by step on doing a basic low res character. It's generally a good idea to start with characters of this size before moving on to larger sprites. In pixel art, you need to get used to working on a very small level, and working with large sprites from the get go won't help you develop the skills you need as a pixel artist. Also, if you don't have a tablet, it's a good investment. After learning how to use it, it will speed up your creation of pixel art considerably. Don't assume that just because you're working with low res sprites, that it isn't as relevant. 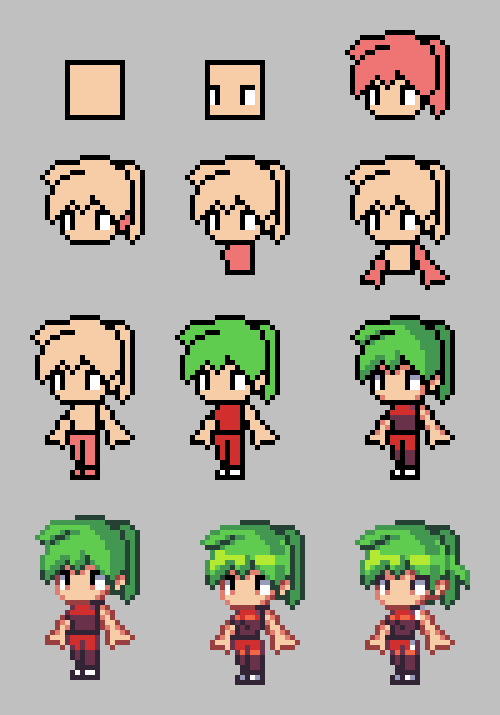 1.Try to keep your first sprites under 40 pixels in height. 2. Don't rip sprites and edit them, always work from scratch. You'll learn faster. 3. Don't constrain yourself to realistic proportions. 4. Avoid drawing sprites that just face right all the time. 5. Look at other sprites online and make observations. Create rules for yourself based on what you see and try to reproduce the same techniques without using reference. 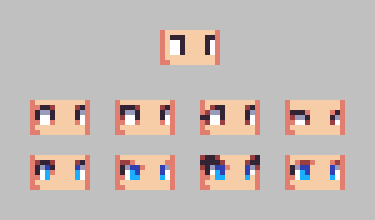 And just as a little bonus, here are some variations of eyes, based off the most basic shape. "if you don't have a tablet, it's a good investment." Who doesn't have a table? He's talking about a drawing tablet; basically, they're pad type things with a pen that let you draw more naturally on a computer. Hey! Thanks for this tutorial. Along with the shading one, it certainly helped me to get my bearings and begin spriting!